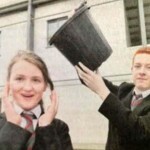 Posted December 24, 2013 by Jacqueline Hogge, Tuam Herald in News. 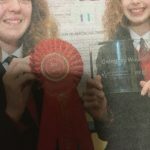 Claregalway’s secondary school may still be in its infancy, but a group of first year students are hoping to make their mark at national level at this year’s BT Young Scientists Exhibition next month. Three months into the school’s first ever academic term, a group of four students are pitting their scientific wits against the best brains in the country in a bid to claim the prestigious title. The 2014 event marks the 50th anniversary of the competition that will be held in the RDS from Thursday January 9th to Saturday January 11th. 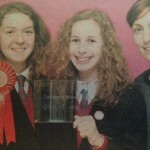 The exhibition is set to be the biggest event with 2,000 ideas submitted by 4,418 students from across 32 counties. Claregalway students Darragh Jordan and Conor Finnerty, along with their classmate Sean Mitchell from Annaghdown, are focusing on sport for this project, as they aim to eradicate the controversy associated with contentious refereeing decisions in handball. The KillTech project is based around the prototype of a laser beam system that is built into a handball court to detect the precise location of the hop of a ball and determine whether or not a point has been reached. Darragh, who has been playing handball for the past three years, says the idea has already received a positive response from senior figures within the GAA. “We’ve been working on the project since October during our STEM (Science, Technology, Engineering and Maths) class and we’ve done a lot of research outside of the classroom, among local handball clubs, that has shown there’s an average rate of 36% decisions contested in matches. “If the ball hits the wall as a first contact then it is a score but if it bounces off the floor before hitting the wall it doesn’t count. There’s a lot of confusion over low hitting scores as to whether or not they are in fact points and this system will eradicate that by having defined laser beams in place to pick up the precise point of contact. The boys’ teacher Eleanor Nolan, says the dedication and commitment shown to the project is enough to deserve merit in the RDS next month. 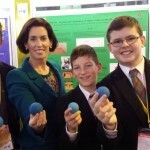 Eleanor has another student entering the competiton, Daniel Broderick, who is basing his study on the production of eggs. The 13-year old is examining the effects of food and water consumption on the quantity and quality of eggs laid, having got the idea from his father’s frustration with the lack of eggs coming from the family’s hens. “My project is a scientific study of the production of eggs depending on their food and water,” he said. “There could be many reasons why hens don’t lay eggs but I thought it was down to the food they were eating, to when I started giving them an extra bit of food, I noticed that the hens started to lay more eggs. The weight of the eggs increased as did their height and width. “When I gave them extra bit of water to see what would happen to the egg’s quality, there was a richer taste to I decided to make a project out of it. Daniel was not deterred from a disastrous attack by a fox on the hen house last month, which reduced his project to a two-hen study. “In any experiment with animals there will be some margin for error as the hens might knock over the food and water or birds might take a bit of food. These factors would affect the results and cannot be factored in on such a small and short term project but I acknowledge that these issues exist and I have done my best to prevent them from affecting my results. “There is also the possibility, as I live in a rural area, of a fox eating the hens, which actually happened last month when a fox attacked the hatch and killed two of my hens leaving me with just a two-hen project. Other schools representing Galway in this year’s exhibition include Presentation College, Athenry with Evan Quirke investigating the merits of reseeding land. 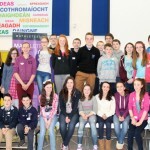 Schools from Galway City, Loughrea, Portumna, Kinvara and Ballinasloe will also have students taking part. 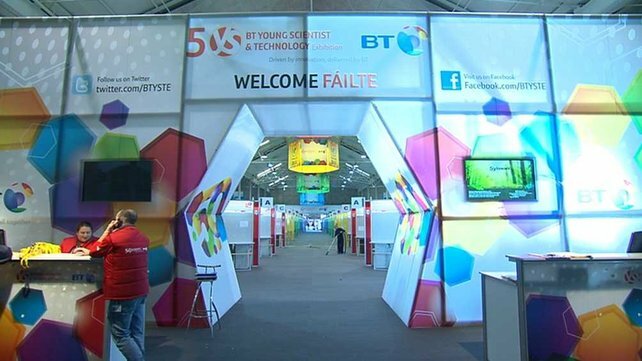 The exhibition will award over 120 different honours on the Friday evening, including the overall BT Young Scientist and Technologist of the Year accolades, while over thirty students will be offered the opportunity to take part in the BT Young Scientist Business Bootcamp, an intensive commercialisation skills programme.